We are entering the most exciting year since 2000. Yes, of course I am talking about 2012, the year that tons of morons are screaming is going to be the last year ever. All because a bunch of people decided to stop updating their calendars. Even more hilariously, it was probably a South American guy who had just finished the work on one huge cycle of day/month/years he had been carving into stone and took a break then realized that he would be good because it stretched roughly a couple thousand years into the future. And even though I have used the image from the Movie 2012 (without anyone's permission) I of course don't believe any of the crazy talk and hype. So, the world isn't going to end because of that. There are plenty of real reasons the world can end and I won't list them (global warming, random asteroid collision, pandemic... Oh wait, I wasn't going to list them). Okay, that is a whole lot of "doom and gloom" to start this off. I will now go into the things we all have to look forward in this coming year. The next CRUMBS show is Tuesday, January 3rd at 9pm at the King's Head Pub. Yes, this is a part of the ongoing and "super-amazingly-hilariously-underground-cool-to-the-max" Free Laughs Comedy Series that is in its 6th Season of bringing high quality comedy to Winnipeg audiences. The shows are free and are upstairs at the King's Head ever single Tuesday night. CRUMBS on Jan 3rd and also Jan 17th, Feb 7th and Feb 21st. The CRUMBS Radio Special on 101.5 UMFM! CRUMBS does a live radio show on 101.5 UMFM every single Monday at 5pm CST where we bring you our very best opinions about the News the News is too afraid to have opinions on. We also have our show streaming live on the Internetz as well as having it Podcasted for future generations. 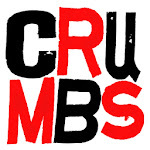 The CRUMBS radio special is our annual Look Back + Look Ahead, where we look back on 2011 and celebrate the lives and News stories that touched us in the brain and heart. We also look ahead to 2012 and give our (quite accurate) predictions for the coming year. Other Free Laugh Shows are great too! The Free Laugh shows at the King's Head are also great and worth their weight in Comedy Gold. The one most everyone is most excited for is the Kings of the King's Head which is the comedy game show show that has been running as a special presentation hosted by Lee White. The next comedy game show is going to be Jan 31st. There are probably other reasons to be optimistic and hopeful in this new year as well. See you at the hilarious comedy shows Winnipeg!